Today we gather on a little Easter – just two weeks since our big one – and still celebrating the fact that the tomb was empty and Jesus is alive. We gather on these little Easters – for as you may recall, every Sunday is a celebration of Easter – in order to meet Jesus in his word and in the sacrament. We are witnesses of Jesus’ resurrection and we proclaim his death and his life by gathering together. Though we have not seen him in the same way that many of the first witnesses of the resurrection saw him, we recognize his presence here. One of the themes that runs through all the Easter Gospel accounts is the idea of seeing . . . or not seeing. It’s all a matter of who has seen Jesus or who has not seen him. The women who went to the tomb said they had seen the Lord. Mary Magdalene saw Jesus and thought he was a gardener and did not recognize him until he said her name. Thomas said he would not believe until he had seen Jesus. And in today’s Gospel – one of my favorite stories in all the gospels — two disciples eventually see and recognize Jesus. I say “eventually” because they did not see him at first . . .even though he was right beside them – walking with them along the road. They were sad because they thought that with Jesus death’ their hopes had been dashed. They tried to tell Jesus – who they thought was the only person in Jerusalem who hadn’t heard – that three days had passed since the crucifixion, the tomb was reported to be empty, but HIM – Jesus – they had not seen. Pretty funny thing to say to Jesus’ face! It wasn’t until the breaking of the bread that their eyes were opened. Then they remembered how their hearts were burning within them when he had explained the scriptures to them along the way. Jesus had led them in a kind of Bible study on the road. And then he showed himself to them as he broke bread with them in their home. In the early church one name for communion was the breaking of bread. So the disciples saw Jesus in word and sacrament and that process of recognizing him through these means of grace continues to be the pattern for our worship – every little Easter Sunday. To see or not to see – that is the Easter question. Many things keep us from seeing him. Many things distract us from recognizing his presence among us. But the same things that revealed the risen Lord to the first witnesses of the resurrection continue to open our eyes. Today our eyes have been opened to see the risen Lord in a new way – literally — in the new artwork that greeted you this morning and will continue to welcome every worshipper to this space. 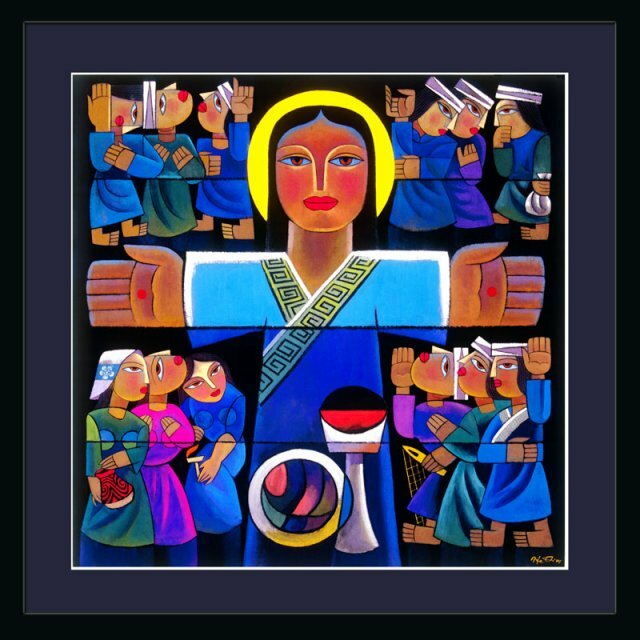 The large print in our entryway is entitled “The Risen Lord” and it gives us a vibrant ,colorful, energetic way to see Jesus. It is appropriate for this gathering of believers here at Grace of God who are, in our own way vibrant and energetic witnesses to the resurrection and who want above all to see Jesus. The print reminds us of the things that might keep us from seeing him and the way we all may recognize him. Surrounding the risen Lord in this painting are four groups of disciples. The first group in the upper left corner are arguing about who is the greatest in the kingdom. Notice the one disciple with the number 1 on his finger! They are disciples tempted by power and status – something the world offers us at a great price. This temptation keeps these disciples from seeing Jesus. Notice none of their eyes are directed at Jesus in the center. They are distracted by the need to be acknowledged and recognized themselves. They want others to see THEM. Might the lure of protecting our rank and making ourselves look good and trying to be successful and respected in the worlds’ eyes keep us from seeing Jesus? Might this quest need to be abandoned if we are to encounter the risen Lord ourselves? The second group of disciples in the upper right corner of this painting are tempted by wealth and material gain. Notice the money bag in the one disciple’s hand and the open hand in another one – he seems ready to grab onto something that he can claim for his own. They are whispering to each other – scheming and strategizing how they can acquire more and keep what they have. Is this secret desire in our hearts as well? The world offers material happiness to us at every turn. We are bombarded with this temptation to fill our pockets, our homes, our garages with more and more. And notice that these disciples are not looking toward Jesus either. Does this obsession with money keep us from seeing Jesus? Do we need to let go of the things that promise temporal security and worldly happiness if we are to encounter the risen Lord for ourselves? In the bottom left and bottom right of the painting we find not the powerful or the wealthy, but the faithful. These six followers of Jesus have their eyes focused on him. In the bottom left we find the women of faith, Mary, Jesus’ mother – the first to express faith in Christ. We have Mary Magdalene, the first to express her faith in the risen Lord and one of the wise virgins from Jesus’ parable who has her oil lamp of faith lit and burning. In the bottom right corner we find the fishermen, those who have turned in their fishing nets to become fishers of men. They have been transformed by Jesus’ call and they have placed their lives on the line to follow him. And in the middle we have the symbols of the Lord’s Supper. Here in the breaking of bread the faithful meet the risen Lord and recognize his presence. Who are you most like? As you continue to look at this painting you may see yourself in different corners from time to time and hopefully, this image will be a reminder for us to focus our eyes on Jesus and see him where he promises to be found – in his word and sacrament. Perhaps we are most like the two disciples in our gospel reading. Moping around totally unaware that Jesus is with us . . . thinking our hopes are gone when our real hope is right under our nose . . Like them we are on a journey sometimes not even realizing that Jesus is with us every step of the way revealing his promise and his presence. Perhaps we are most like the two Emmaus disciples . . . ready to welcome Jesus … hearts burning and eyes opened . . . gathering with him at his table and eventually – with our hope firmly established — recognizing him in the breaking of bread.